Thank you for helping us through a very challenging and, at times, sad year. Through it all, you have helped to keep KNOM on the air 24 hours a day. You keep us on the air through your prayers, your financial help, and your kind words of encouragement. 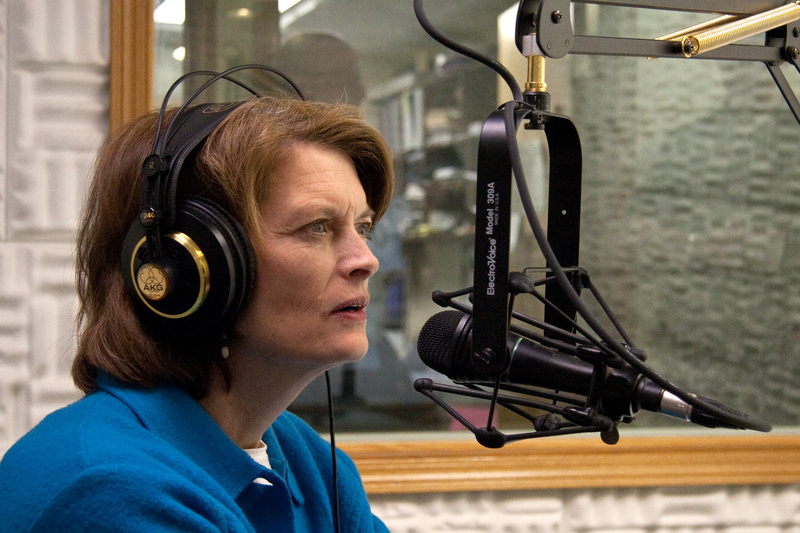 You inspire us to continue this critical radio mission for thousands of families spread across Western Alaska. Thanks to you, KNOM listeners hundreds of miles away – in villages where there are few, if any, priests – will be able to pray along with the Mass on Christmas Day. Your help allows us to share the miracle of Christ’s birth with our brothers and sisters in the most remote corners of Alaska. The financial picture has brightened a bit; we’ve received many generous gifts from old friends and new supporters. Some donors have even reached out to their parish family, their friends, and their loved ones to ask for support for KNOM. No matter how you’ve chosen to help, it’s deeply appreciated: more than we can say. Thank you for all you do for the KNOM Radio Mission; any success we found in 2010 was made possible through your generosity, your faith, your devotion. From our family to yours, all the best for a peaceful and joyful 2011. We’re so glad you’re a part of our mission, and we can’t wait to continue that mission, together, into the New Year. Amid the snow and the storms, we know that the best is yet to come. Giving and Receiving: If you gave one hundred dollars or more to the KNOM Radio Mission during 2010, please expect a tax receipt from us in mid-January. You should receive it by the end of the month; if not, let us know! Feel free to contact Lynette or Betsy in our business department at (907) 443-5221 or by email at business@knom.org. And of course, if you gave in any amount this year, we thank you! 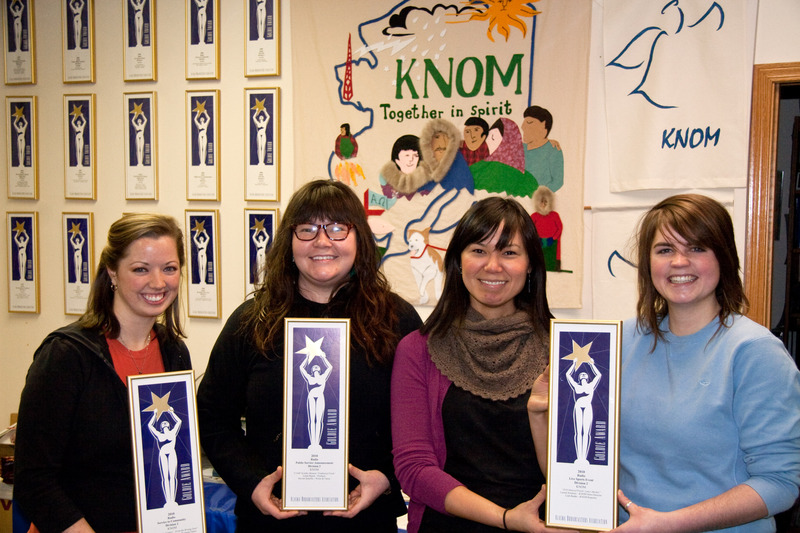 Golden Accolades: KNOM has won three 2010 Goldie Awards from the Alaska Broadcasters Association! In the “Public Service Announcement” category, an award for “CAMP Healthy Moment: Traditional Foods,” produced by KNOM’s Linda Maack (far left in photo) and written and voiced by Moriah Sallaffie of Nome’s CAMP Department (an organization dedicated to healthy living and diabetes prevention; she’s pictured to the right of Linda). 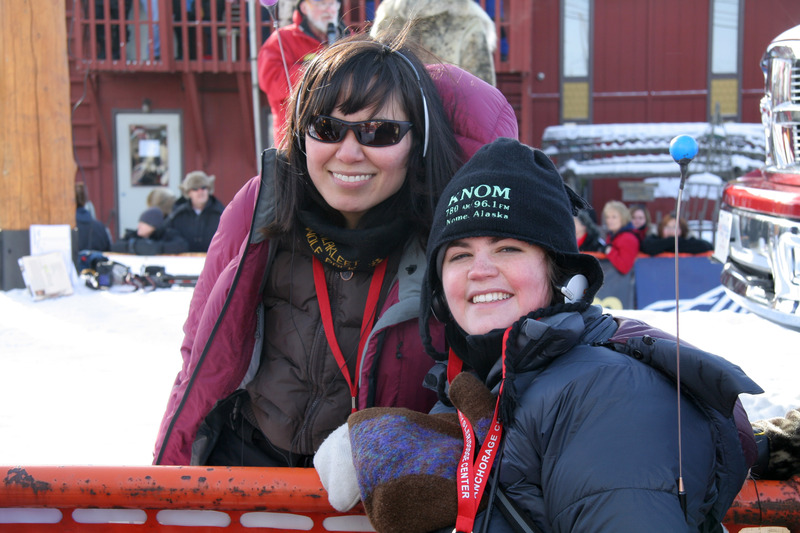 In the “Live Sports Event” category, a Goldie for our live coverage of the 2010 Iditarod finish, hosted by news director Laureli Kinneen and volunteer Leah Radde (at right in photo). In the “Service to Community” category, an award for “From the Writing Desk,” created in collaboration with Nome Community Center’s Tara Schmidt. Tara, the daughter of general manager Ric Schmidt and business manager Lynette Schmidt, is hard at work at college - studying broadcasting! - and couldn’t make it for the photo at left. Your support made these award-winning programs possible; congratulations, all! The cost of operating the KNOM Radio Mission for the fiscal year ending June 30, 2010 was $1,279,917. Our income for the same period (fiscal year 2010) was $1,268,350. 97.6% of this income was donations from good people like you. The remaining 2.4% came from program underwriting by businesses, rental of tower space to the National Weather Service, and several other incidental sources. 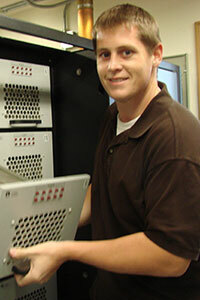 Over the years, we have taken every possible measure to reduce expenses. This year, despite the dramatically increased cost of electricity and fuel oil in Nome, our total expenditures were lower than five of the past six years. We’re proud of this, especially since – according to the University of Alaska – the cost of living in Nome has increased 23%, skyrocketing to 221% the cost of living in Portland, Oregon! KNOM’s first year on the air, 1971-1972, cost about $400,000. Today, after inflation, that would be more than two million dollars: well over our fiscal year 2010 expenses. We’ve done our best to be smart with our budget, and – especially considering the current financial climate – we’re happy with the results. The original KNOM studio was an old home with thin walls. The volunteer dormitories were old World War II “temporary” knockdown (KD) buildings: prefabricated structures cobbled together by the Army in 1941. Between 1991 and 1993, we replaced everything with two super-insulated buildings with more floor space and 15 inches of insulation in the walls. Back in 1979, we consumed a whopping 10,746 gallons of fuel oil. Last year, thanks to the new buildings, we used only 1,780 gallons: a savings of more than $47,000 at today’s prices. If you helped with the construction, thank you! If you weren’t friends of the mission then, you can rejoice that those who came before make your gifts even more effective. 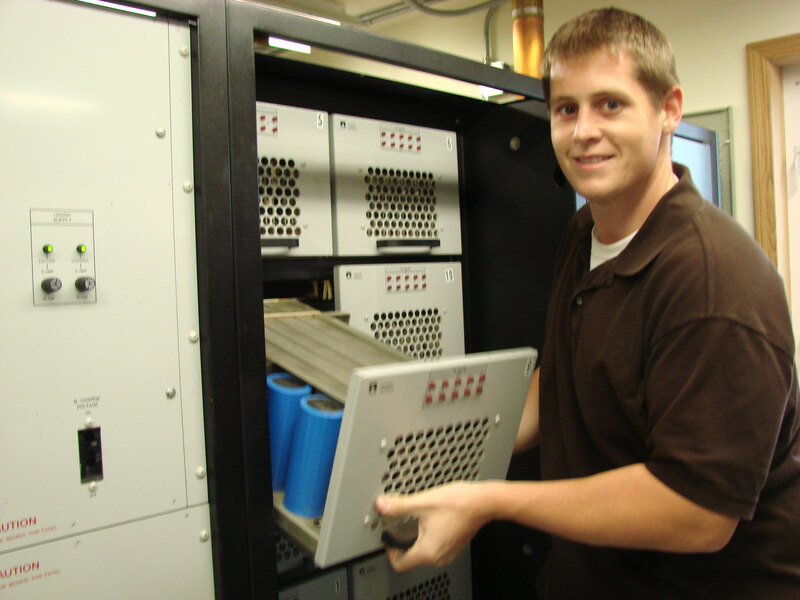 In 2003, we replaced our tower’s 1,475-watt lights with light emitting diodes (LEDs) that consume only 100 watts, figuring that they would pay for their $8,000 installation in five years. The following year, we realized something else. It was costing the mission about the same amount – $8,000 a year – to bring up a tower crew to replace the old bulbs. (Federal law requires a licensed crew of three for any tower work.) In short, these LEDs have saved the mission more than $60,000: pretty impressive for just a few light bulbs. Pepper calls attention to itself. That’s what it’s supposed to do. Salt, when used in appropriate amounts, calls attention to what it’s seasoning. Are you salt… or pepper? 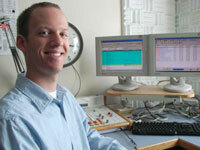 By the end of 2010, KNOM will have broadcast about 68,000 spots: half educational and half inspirational. We’ll have aired about 70,000 hourly weather forecasts: each one essential, since KNOM’s coverage area is so vast, and since information on weather can mean life or death in this remote part of the world. Add to this 40 call-in programs and about 250 local and regional news interviews. KNOM has been a positive companion for thousands of families this year: thanks to you. January: Exceptional winter storms hit Western Alaska. Storm watches and warnings are issued for all eight regional zones covered in KNOM’s weather reports, which, for the second time in the season, exceed 10 minutes (they’re normally only about 3 minutes). 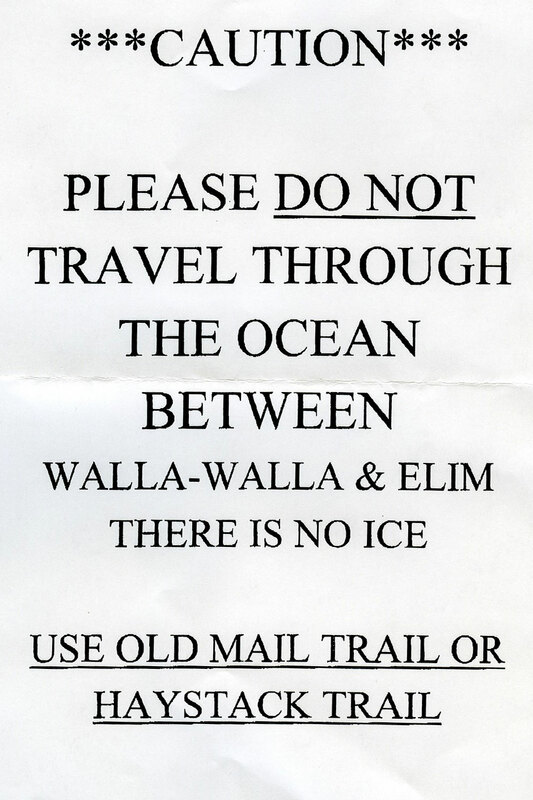 Near Elim – a village about 100 miles east of Nome and well within KNOM listening country – a man is stuck in the elements because of a failed snowmobile. 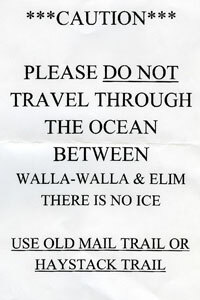 While rescuers search for the man, KNOM broadcasts warnings about the dangerously thin ocean ice in the area, advising listeners to find alternate routes when traveling in the wilderness. (See the announcement at left.) The lost man is ultimately found, and all return home safely. If KNOM were located in New York City, our regular listeners would be located throughout Connecticut and Rhode Island, all of New York State, New Jersey, Pennsylvania, Delaware, Maryland, and much of Virginia, West Virginia and North Carolina, as well as eastern Ohio. Along the coast, we could be heard as far south as northern Florida… It is truly a vast area. March: KNOM rallies to cover the 38th running of the Iditarod: a 1,000-mile sled-dog race that ends just blocks from KNOM studios in Nome. 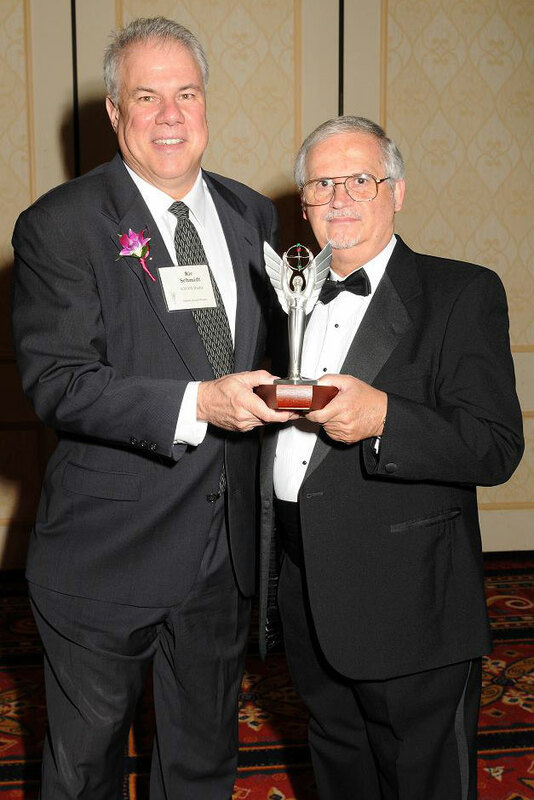 April: KNOM is honored to learn it will receive a Gabriel Award for Radio Station of the Year from the Catholic Academy for Communication Arts Professionals (CACAP). It’s the station’s 18th such award and its 15th top Gabriel in a row. May: The Nome Static reports that KNOM has broadcast about 2,100 airings of the Sunday Mass and about 13,000 (nightly) readings of the Rosary. Throughout our 39-year history, these two programs have remained among our most popular. In the last couple of years, KNOM has survived 100-mile-per-hour hurricane-force winds, lightning strikes, a firebombing, week-long snow storms, ice jams and floods, food and material shortages due to volcanic ash, and a financially disastrous diocesan bankruptcy… and we are still broadcasting. If I could afford to give a copy of this Gabriel to all those responsible for this award, we could fill up one of these big cargo ships out on the Mississippi. At left, Ric receives KNOM's 2010 Gabriel from Frank Morock, CACAP president. 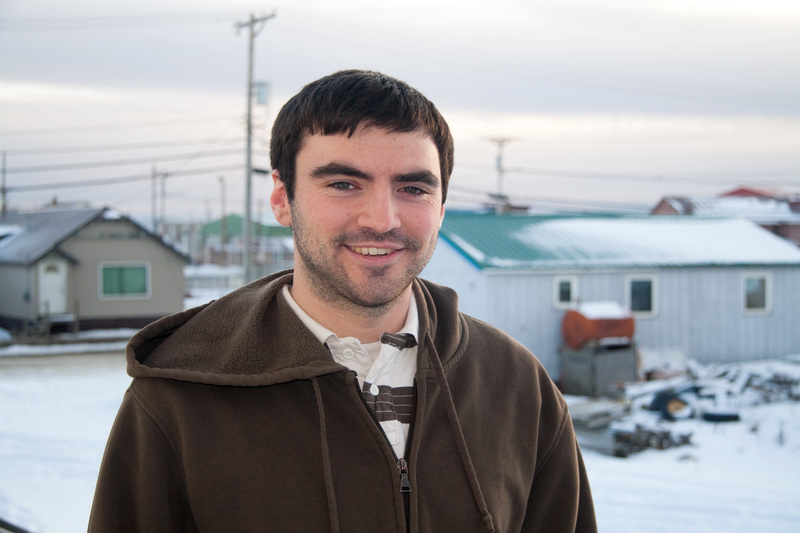 In mid-June, the first of our newest generation of KNOM volunteers – Ben Matheson – arrives from Minnesota. He hits the ground running in the news department. 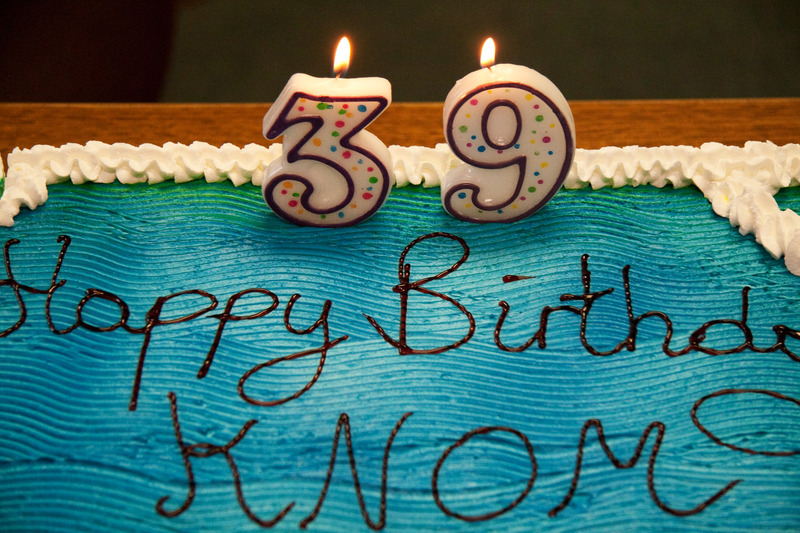 July: On July 14th, KNOM celebrates the 39th anniversary of its first official broadcast. It’s no ordinary birthday party; in addition to an all-day open house at KNOM studios, the station announces the creation of a new 501(c)3 non-profit organization, KNOM Radio Mission, Inc., established to continue the tradition of award-winning radio service for the people of Western Alaska. August-September: As the short Arctic summer gradually turns into autumn, it’s a season for hellos and goodbyes. Second-year volunteer Danielle Sylvester (photo top left) finishes her term and departs KNOM but not Nome; she settles in town and goes to work at the Nome Community Center as a coordinator for tobacco use prevention programs. Meanwhile, two more full-time volunteers join the team at KNOM: public affairs director Matthew Smith (photo middle left) and production director Matty Guiffré (bottom left). For the first time in many years, the KNOM volunteer program counts five full-time members in its ranks. As it has done for four decades, KNOM provides regular news about the policies of Alaska’s elected officials; in November and December, our newscasts include comprehensive coverage of the 2010 Congressional races. 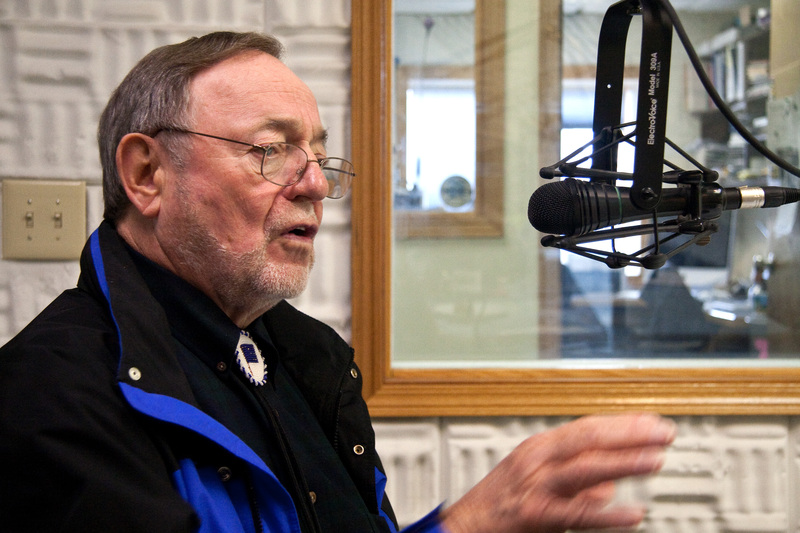 December: Just before this year-end Static issue goes to press, we receive word from officials with the Iditarod Trail Sled-Dog Race that Tom Busch and KNOM Radio will, together, be the honorary musher for the 2011 Iditarod! At the ceremonial start of this year’s Iditarod, in downtown Anchorage in March 2011, a representative for Tom and KNOM – likely Tom’s wife and former KNOM business manager Florence Busch – will mush a dog team from the starting line, wearing honorary bib #1.